I came to the realization a few days ago that this blog has slowly been deviating away from the "crafty" part and has been turning into a blog about knitting. To those readers who do not knit or know nothing about knitting, I am truly sorry. I swear, I'm trying to venture back out into other crafty endeavors. It's just that trying to find the time to sit down and sew during "normal" hours (i.e. when the wretched neighbour downstairs isn't home to make a fuss about the so-called excessive noise) without the Munchkin around is next to impossible. It's times like these that I really wish I had family around who would be willing to look after him for a few hours a week. I really don't know how other stay-at-home moms do it! 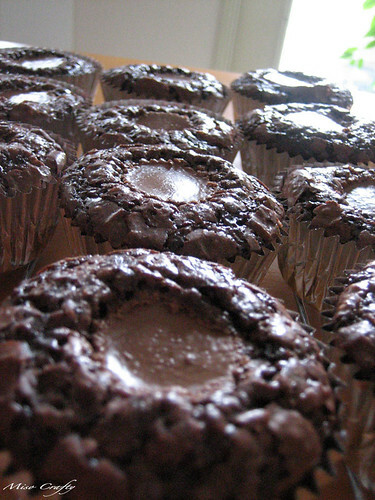 So, until I start living up to my blog's moniker, I give you my latest baking creation: Chocolate Brownie Peanut Butter Cups! I saw the recipe for these in a magazine at the doctor's office a week ago and was finally able to make them for mine and Brett's anniversary this past weekend. 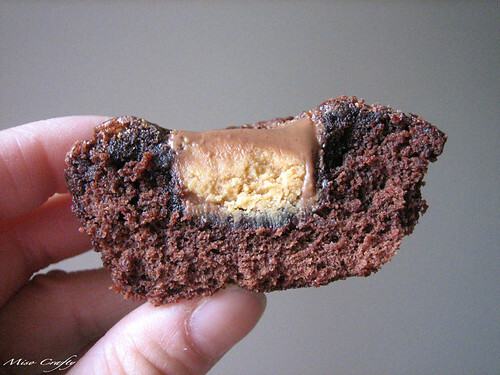 I didn't get the chance to write down the recipe, but I did remember that it involved a boxed brownie mix and mini Reece's Peanut Butter Cups. I think the recipe calls for a fudge brownie mix, which my nearest grocery store did not have (not unless I wanted to the low-fat version...but seriously, a low-fat brownie??? What's the point then??). Since the store didn't have what I was looking for I had to settle for the frosted brownie version. The recipe also called for mini aluminum baking cups that are a bit larger than the Reece's PB cups, but since those are hard to find I just used the regular sized aluminum ones instead. I personally don't think it really matters cause either way they come out absolutely full of yummy goodness. You would just get more out of the mini version. I made these while Brett was at work (so that I could surprise him when he got home) and kinda wished I had waited until he was home cause these are truly the ultimate treat still warm. By the time he did get home they had already cooled down, but that didn't stop him from consuming 3 of these bad boys in a 5 minute span! I think I'll definitely be making these again sometime soon! - Preheat oven to 350°F. - Cool 5-10 minutes in pan, then move to a cooling rack to cool completely. goodness Melissa! those look sooooo yummy!!! So, I'm thinking I should have you over (maybe with a few other ladies) to my place for a ladies night (which would of course include knitting) - what do you think? Those look dangerously delish!! I can feel my bum expanding just looking at those! Jennifer, not only are they dangerously delish but they are uber easy to make too...a deadly combo if you ask me. But for some strange (and maybe lucky?) reason whenever I bake I usually only eat a bite or have one or two and then can't eat any more of it, and Brett is forced to either eat it or take it to his office. I think that really helps in the weight control area!